It’s amazing how your body, mind and soul are just aware of things, like certain dates or significant times of the year. You might be feeling sad or anxious for what seems like no reason at all, but subconsciously it all makes sense, and when you consciously realize the reason behind it, you wonder why you didn’t connect the dots sooner. It’s like every year at the beginning of December, I become kind of melancholy. And every year I don’t realize immediately why that is. At first I think “Oh, it’s the holiday blues,” you know, how they say a lot of people get depressed around the holiday season, and then I realize that it’s because the beginning of December was the beginning of the end of my father’s life on earth. It was Sunday, December 8th, 2002. We had come home from church and Daddy and I were going to head out to the mall to see the Christmas decorations. 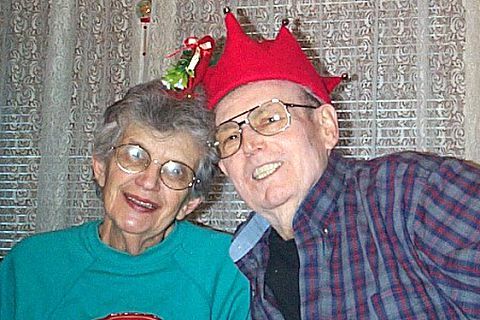 He loved Christmas, and he definitely passed the fondness for the holiday along to me. He was upstairs getting freshened up and he called down for my mother. His leg was extremely swollen and he didn’t know what to do. Off to the emergency room we went. We didn’t get to see the decorations that year. He had a blood clot in his thigh, an effect of chemotherapy. About two weeks in the hospital and he was back home. I put the big tree and the stockings up to prepare for his homecoming. We had two artificial trees – a big one that Daddy and I loved putting up, and my Mama’s “Charlie Brown” tree, which she preferred. I remember while he was in the hospital praying to God to just let him be able to have a good Christmas. And he did. It was shortly after Christmas that he began being confused – mistaking day for night and vice versa. He was weak and couldn’t make it to the bathroom on his own. He spent most of the time in bed, and he would need assistance getting dressed or to come downstairs to be with the family. He would forget how weak he was and attempt to get out of bed and fall to the ground. Many times I would have to pick his heavy, limp body up and back into bed or guide him with his walker into the bathroom, only for him to collapse when we got there and then have to call my sister and nephews to help me get him up. On January 21st I was home from work when the doctor called. Daddy needed a vitamin K shot. They had been sending a nurse to monitor his blood levels at home. It was either the emergency room or the doctor’s office by noon and there was no way my mother and I could get him ready and out to the office by then. My sister and nephew came over and we brought him to the ER. It was the first time my mother had never accompanied him on the trip to the hospital, and it broke her heart to stay home. But it was freezing outside and the air was not good for her breathing. We made that call for her. He was too weak to sign papers so I had to sign for him. When it was our turn and the doctor saw us, he said “This man needs more than a Vitamin K Shot, he needs a blood transfusion.” Exactly one month later, late at night, he peacefully passed away. He lived with cancer for 17 years of his life. It had spread to the bone, formed a mass that blocked his kidney and had taken him over. Exactly five years later to the day that we brought my beautiful, courageous father to the hospital , my sweet Mama passed away at home, just as she had wanted it. Emphysema and COPD had gotten the best of her, she couldn’t fight anymore. When she came home from the hospital on that Friday, she told me “God gave me a good life.” I couldn’t understand how she thought that, after all the suffering she’d been through in her life. I told her I admired her faith and wish I could have a faith as strong. “You do,” she said. “Be good to one another.” She made her journey to heaven just three days later on Monday night, to join Daddy in a place where there is no more pain, no more cancer, a place where they can breathe easy and be together forever. Yesterday I was sad and didn’t know why. I wasn’t uncontrollably crying or outwardly sad. I was feeling kind of empty inside. And then today, as I was driving on my way to work, it hit me. Yesterday was July 21st. Six months since my Mama left this earthly world for a better place. That’s when I began uncontrollably crying. That’s when it hit me like a ton of bricks sitting on my chest, like I couldn’t breathe. Because the reality set in that the amazing woman who gave me my life, who gave me the very breath I breathe, has been gone for six months. It was sixth month sadness. Tags: christmas, Family, father, holidays, memories, mother, sadness, subconcious. Bookmark the permalink. Previous post ← Speak now or forever hold your beet! I really enjoyed reading these-thanks for sending-I am adding to my favorites and will check in from time to time. You had me crying and laughing just like you always used to…Miss you girl!